There are two reasons I choose this book. 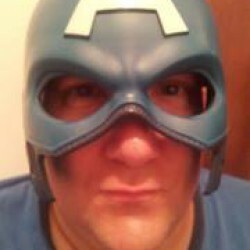 One, because I’ve heard so much about it (including from my sister—hi, Kathy!). Two, because of David Mitchell. I’m super excited about the upcoming THE BONE CLOCKS and wanted to read and review this and CLOUD ATLAS leading up to that. 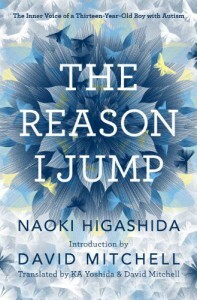 THE REASON I JUMP not only shows the life of thirteen-year-old autistic Naoki Higashida, but also serves as a conduit for a parent of an autistic child to share the beauty found within autism with the world. Thanks to Mitchell and his wife, we are able to read in English what otherwise would have been missed. That’s what this book means to me: capturing the beauty that is otherwise missed. Someone helped and taught Higashida to use an alphabet board to communicate. The messages he delivers are mostly in answer to questions, such as “why do you jump so much?”, or “why do you make so much noise?” (nothing is too personal), and the rest in short stories. At first, the message of struggle is clear. To communicate, when communication is impossible. To want to be watched, when no one knows what to do. To be a part of the group. The message then moves into the more detailed world of Higashida. If you pay attention, there is much we can learn. His world, as many with autism, is not measured in time. It is measured in beauty and fascination. After answering several questions, he shares the story of the tortoise and the hare. Their second race, the tortoise tips over, but everyone is at the starting line, helping him and not at the finish, cheering the hare. Later, he shares his story of the airplane, where he feels comfort strapped down above the earth in his own gravity. Yes, there are complexities, but there isn’t critiquing. There are fears, but there is serenity in movement. It may seem like two different worlds, but each has a message for the other. We just have to listen. Thankfully, the message was given and translated to make that process easier.